Win Liam Neeson's 'Run All Night' on Blu-ray! 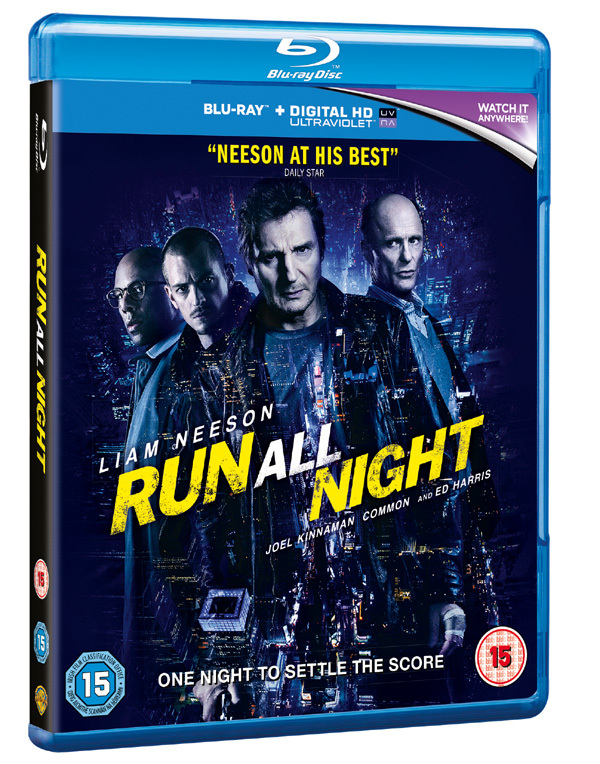 Win Liam Neeson’s ‘Run All Night’ on Blu-ray! Posted August 5, 2015 by William Martin & filed under Win. Directed by Jaume Collet-Serra (Non-Stop), Run All Night is the new action thriller starring Liam Neeson doing what he does best. > Buy Run All Night on Amazon. To celebrate the release on Blu-ray™ and DVD on Monday 10 August, we’ve got Blu-rays to give away to four of our Twitter followers! The unmissable actions stars Oscar® nominee Liam Neeson (Schindler’s List, Non-Stop) as hit man Jimmy Conlon; Joel Kinnaman (The Girl with the Dragon Tattoo, RoboCop) as his son Mike Conlon; Vincent D’Onofrio (The Judge, Daredevil) as Detective Harding; Bruce McGill (Ride Along, Lincoln) as Pat Mullen; Genesis Rodriguez (Identity Thief, Man On A Ledge) as Gabriela Conlon; Boyd Holbrook (Behind the Candelabra, Gone Girl) as Danny Maguire; Holt McCallany (Gangster Squad, Golden Boy) as Frank, Common (Now You See Me, Selma) as Andrew Price; and with Oscar® nominee Ed Harris (Pollock, The Hours) as mob boss Shawn Maguire. Brooklyn mobster and prolific hit man Jimmy Conlon (Neeson), once known as The Gravedigger, has seen better days. Longtime best friend of mob boss Shawn Maguire (Harris), Jimmy, now 55, is haunted by the sins of his past—as well as a dogged police detective (D’Onofrio) who’s been one step behind Jimmy for 30 years. Lately, it seems Jimmy’s only solace can be found at the bottom of a whisky glass. This competition has now closed. The winners are Tarina Brooks from Stevenage, Shauna Kitterman from Slough, Angela Skaggs from Ayr and Matthew Brandt from Rochester.